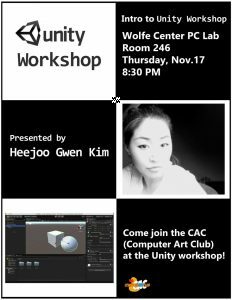 One of our professors, Heejoo Gwen Kim, taught an introduction to Unity workshop. This workshop helped those who have never opened the program as well as helped to promote her full class on Unity and creating games. Those who were unfamiliar with any 3D software were helped by older students and those who have taken her class already helped everyone to figure out the software. This demo was simple enough for those with basic 3D skills to follow and we were able to create a character that could run and jump around a scene!